Beautiful fully lined Maxi Dress Size S (8) ZARA. Cut out features under the bust. NWOT. Next Crop Jeans Pale Blue Size 10. Condition is Used. Dispatched with Royal Mail 2nd Class. Zara Chain & butterfly Print Blouse . Best suit S/M 10 12, loose fit style. gorgeous blouse with contrast cuffs . very en -trend at moment . never worn x Dispatched with Royal Mail 1st Class. Zara - blouse with cocktail print. Very good condition, worn once. ladies zara top size small. Only worn once so in excellent condition from a smoke free home. zara beaded Shirt dress. Blush - ivory in colour Worn once as a longline jacket Condition is Used. Dispatched with Royal Mail 1st Class. Beautiful Zara Cream Brides Bridesmaid Wedding Party Prom Boho Beach Long Dress size S. Great condition.worn only once. From smoke & pet free home Dispatched with Royal Mail 2nd Class Letter. ZARA KNIT ROLL NECK JUMPER. Soft feel knit. 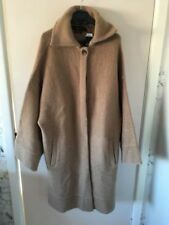 THIS IS FOR A BEAUTIFUL ZARA CAMEL CABLE LONG CARDIGAN WHICH COMES IN A SIZE MEDIUM COMES BRAND NEW AND FROM A SMOKE FREE HOME. Zara Ivory Wide Legged Floral Design Cropped Trousers Size S. Condition is Used. These beautiful trousers have only been when once for a few hours and are in excellent condition Look great dressed up with heels or wedges or worn with flip flips or sandals Dispatched with Royal Mail 1st Class. Zara Contrasting Pleated Blouse Dress Shirt Top Off White Mini. Size Small S. I'm a 10 and it fits me nicely. Can wear as a dress or pair it with some jeans - looks amazing either way! Condition is brand new with tags. Zara blouse in XL cute motifs and neck and colour detail. buttons down the backCondition is Used. ZARA Knit Oversized Beach Dress/Bikini Cover Up/Tunic Size M. Cream. ZARA Knit Oversized Beach Dress/Bikini Cover Up/Tunic Size M. Cream. Gorgeous tunic/beach dress/Bikini cover up, Fab condition! Zara, Size XS, Cream, Lace Fitted Long Sleeve Top . Dispatched with Royal Mail 1st Class. Zara Ladies Size Large Floral Dress. Only worn once Condition is Used. Very good condition Dispatched with Royal Mail 2nd Class. BNWT Ladies Leopard Print Blouse, Medium, Zara. Condition is New with tags. Dispatched with Royal Mail 2nd Class. Zara Ribbed Cream Jumper Size Medium . Condition is Used. Dispatched with Royal Mail 1st Class. It h as m ak eu p wh ic h is f ro m tr yi ng o n pl ea se s ee pictures. ZARA FLORAL EMBROIDERED SHIRT TOP BLOUSE SIZE XSMALL XS UK. Condition is Used. Dispatched with Royal Mail 1st Class. Ladies Zara cream dress with floral design to front and plain back. Ladies ZARA Summer Top - Size Small. Condition is Used. Dispatched with Royal Mail 1st Class. Zara Basic Cream Ivory Beaded Maxi Dress Size Small. Condition is Used. Dispatched with Royal Mail 2nd class. They are a small size 44. Typical Zara sizing. Capri length. 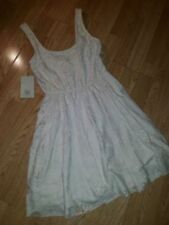 zara summer dress size s. Condition is New with tags. Dispatched with Royal Mail 1st Class. Zara Cream Sleeveless Top Size XS, zip back. Dispatched with Royal Mail 1st Class. Lovely easy to wear longline cardigan with front pockets from Zara. Medium but fits 12-14 oversize and long length. Thin knit top with cream pvc panel & pockets towards bottom of the cardigan. Immaculate as hardly worn. No reserve!!!! FOR SALE IS A LADIES TOP BY ZARA. COLOUR: CREAM. Womens ZARA Top Size Small. Condition is used but in very good condition. Vest top under top. Medium Size Zara Knit Jumper. From the Knitwear collection. Condition is New with tags. Dispatched with Royal Mail 1st Class. 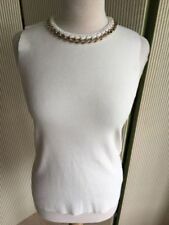 Zara Blouse NWOT cream sleeveless UK S, hidden buttoned front, collar with black removable tie, front also has decorative gathered pleating from shoulders meeting in the centre, just below armpit level, Blouse 25” 64 cm in length. No returns, selling unwanted personal items, this is not a business. PayPal only, 2nd class signed for as this way there is no issue with buyer receiving item. 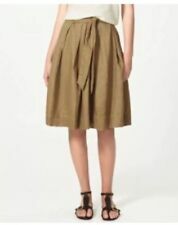 zara dress medium new. Condition is New with tags. Dispatched with Royal Mail 1st Class. Lovely summer dress. From a smoke and pet free home. Cream Lace Top Zara Size M Unworn. Short sleeves gorgeous detail. Dispatched with Royal Mail 2nd Class. Zara Knit Cream Waterfall Cardigan, Size S. Great condition, rarely worn. LONG BELL SLEEVE. GORGEOUS TOP. WOULD FIT UP TO SIZE 12. 59% VISCOSE/41% LINEN. THERE IS A THREAD PULL ON THE OUTER CUFF AS SHOWN. NON SMOKING HOUSEHOLD.